refinery to user, oxidation, heat & pressure of engines, pumps & injectors, and by water & microbial contamination. This continuous process affects combustion and engine performance causing loss of power, excessive fuel consumption, smoking engines, damage to injection systems. Eventually, filters clog and sludge (algae, gum, tar, varnish, wax, etc.) accumulates in fuel storage tanks. fuel droplets. 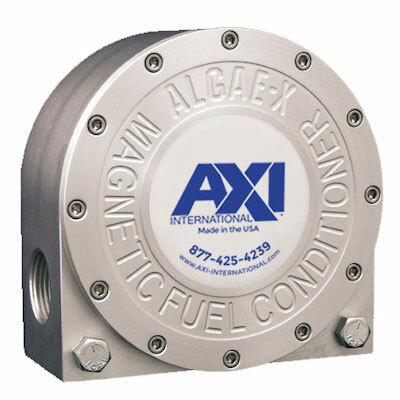 AXI Fuel Conditioners are self-cleaning, have no moving parts, require no electrical hookup and are maintenance free. Can be used in applications with diesel, jet fuel, kerosene, oil, hydraulic fluid, etc.